Her memoir Ordinary Light (2016) was described by the Guardian as "A powerful meditation on being a daughter and, by the end, on being a mother, too." In it she writes of her mother's impending death: "When the dark outside was real*not just the dark of approaching winter, and not just the dark of rain, which we'd had for days, too*her dying came on. We recognized it. We circled her bed, though we stopped short of holding hands, perhaps because that gesture would have meant we were holding on, and we were finally ready to let her go." Smith has published four books of poetry: Wade in the Water (2018); Life on Mars, which received the 2012 Pulitzer Prize and was selected as a New York Times Notable Book; Duende (2006); and The Body's Question, winner of the 2002 Cave Canem Poetry Prize. 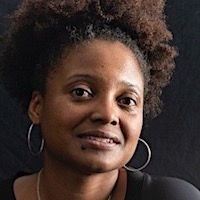 She received her undergraduate degree from Harvard, earned her MFA at Columbia, and was a Stegner Fellow in Poetry at Stanford University from 1997 to 1999. She is the Roger S. Berlind '52 Professor in the Humanities and director of the Creative Writing Program at Princeton University. She lives in Princeton, New Jersey.